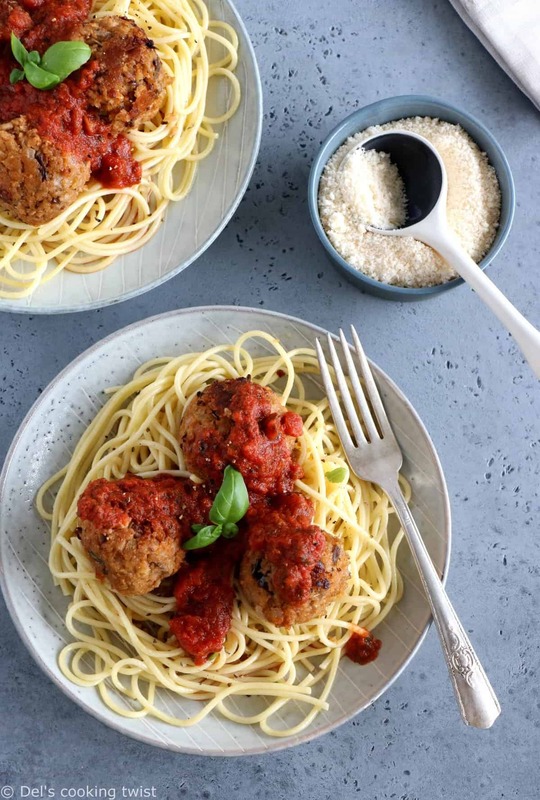 These vegetarian eggplant meatballs are game-changing and will make you forget about meat. Easy to prepare, they are best served with spaghetti, such as these ones made with kamut®. I have a thing for vegetarian or vegan meatballs. 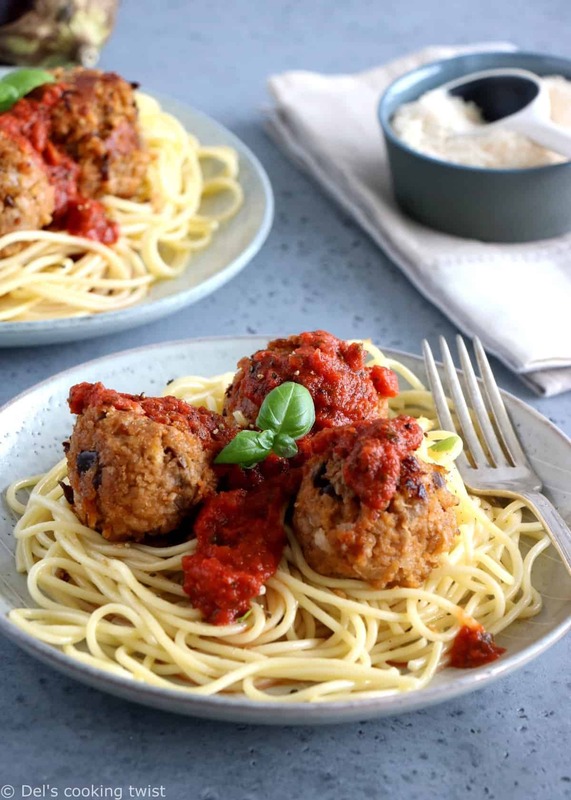 In the shape of classic meatballs with a texture very similar to them, they are actually meat-free, extremely flavorful and very fulfilling. 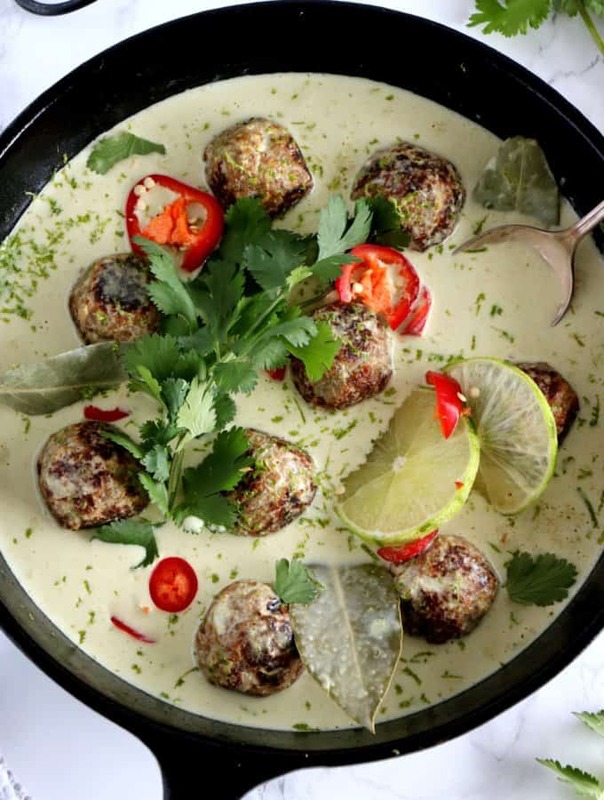 You might have seen already my Thai green curry vegan meatballs made out of chickpeas and that I posted a few months ago; if you haven’t I invite you to try them. 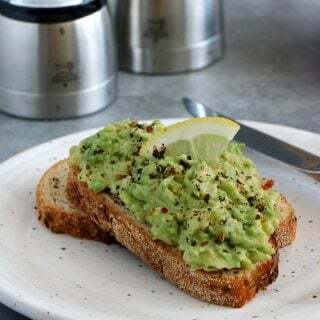 I’m back today with a completely different recipe, which is vegetarian rather than vegan, although you could also turn it vegan if you wanted to (see below). 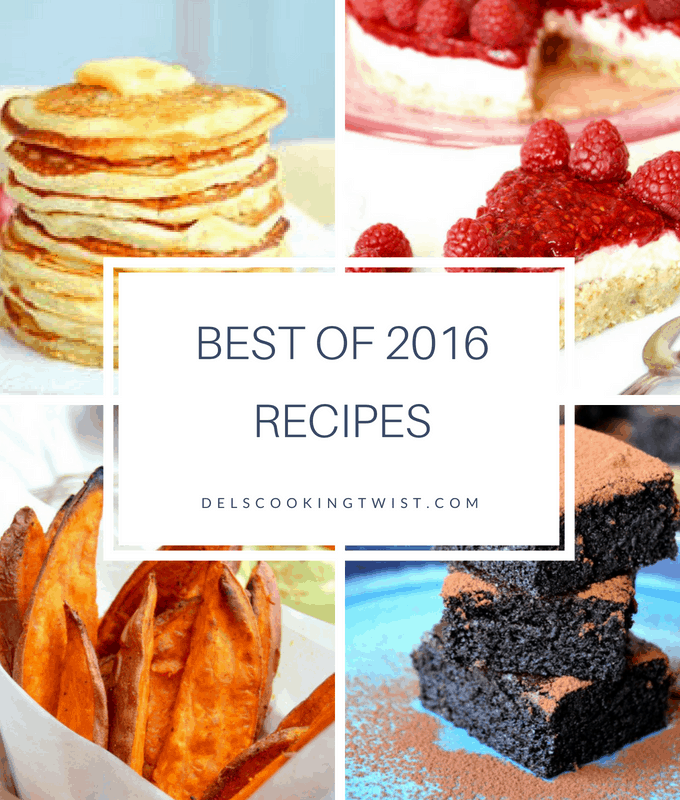 The recipe is simple, inspired from Italy, and prepared with just a few ingredients. Eggplant is magic: it has this chewy meat-like texture without the taste. Here we simply sauté them with onions in olive oil, then mix in a food processor until they turn into a smooth and slightly chunky texture. Transfer to a large mixing bowl and combine with other ingredients such as an egg, bread crumbs and parmesan. Season with salt and pepper and shape into balls. Easy. 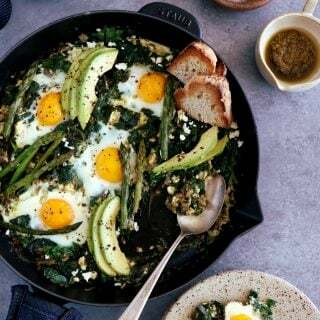 For a vegan version, you would need to replace the egg with a flaxseed egg (made out of 1 Tablespoon of ground flax seed and 3 Tablespoons of water combined together for 5-10 minutes). Instead of bread crumbs, you could simply go for oats, that I prefer to grind, but you could also use half ground oats, half plain, you choose. Then I would simply skip the parmesan and add a little bit more of oats. I am not myself exclusively vegan, although my lifestyle tend towards that direction. 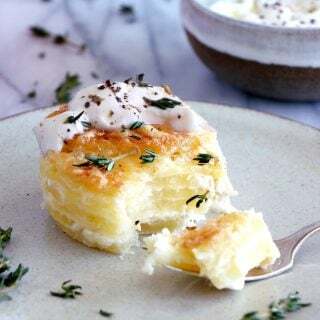 As a result, I can sometimes prepare this recipe in a simple indulgent vegetarian version, sometimes in a vegan version. Like for classic meatballs, I gently fry them in a sauté pan until golden and crispy on all sides. When ready, serve with tomato sauce and pasta, which create a beautiful vegetarian Italian dish. 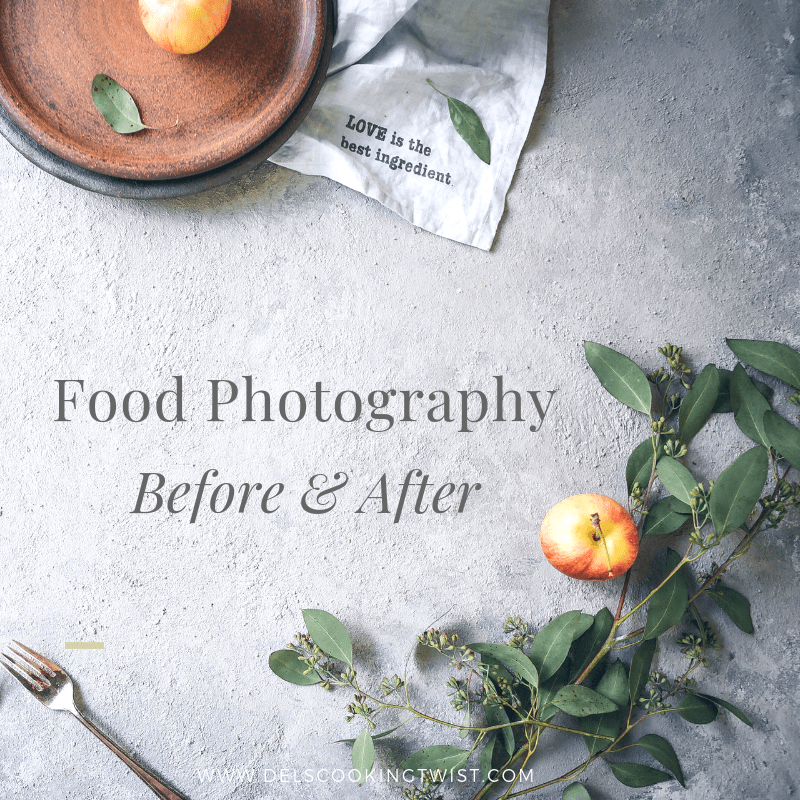 I go for ready-to-use tomato sauce, preferably with garlic and basil, but you could go for any other one of your choice and even prepare your very own version if you have one. Take a bite and it’s like being in Italy: beautiful sun-drenched eggplants, grated parmesan cheese, and a classic Italian tomato sauce. Now the best part: serve with pasta! Or to be more exact, with spaghetti. 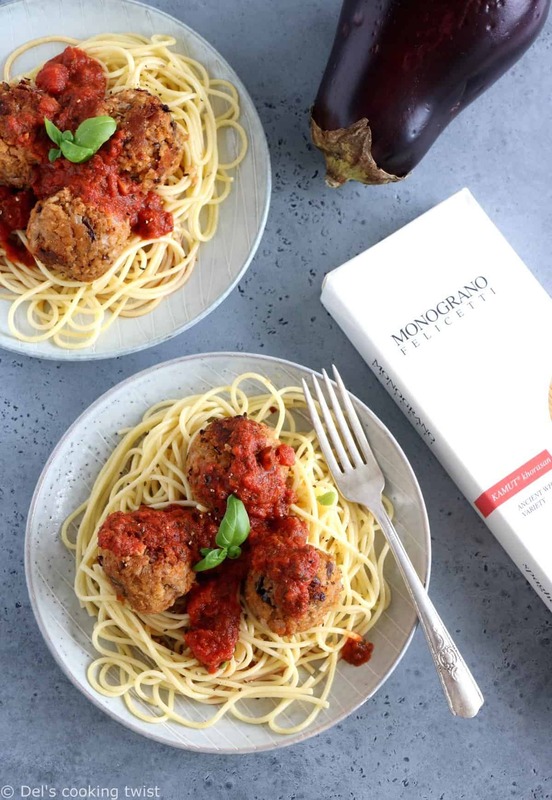 Meatballs and spaghetti always make a wonderful combo, and these vegetarian eggplant meatballs are no exception here. For this recipe I wanted the very best quality of pasta and opted for Monograno Felicetti Organic kamut spaghetti pasta. I hence partnered with the brand behind this wonderful kamut grain: Kamut® brand khorasan wheat. But what is kamut exactly? Have you heard of it before? KAMUT® khorasan wheat is an ancient wheat, most likely originating in Mesopotamia, and guaranteed to be always grown certified organic, never hybridized or genetically modified. The grain has a sweet nutty-buttery taste and firm texture, that makes it very close to classic wheat pasta. Compared to most modern wheat however, KAMUT® khorasan wheat is easy to digest and is prized for its nutrition, with more protein, amino acids, vitamins and many minerals, especially selenium, zinc and magnesium. Note that Khorasan remains a variety of wheat and thus has gluten. However, many people with sensitivities to modern wheat report being able to eat KAMUT® khorasan wheat with no difficulty, as this ancient grain specificity is that it has not been changed through modern plant breeding programs unlike the intensive breeding programs that have significantly altered modern wheat. 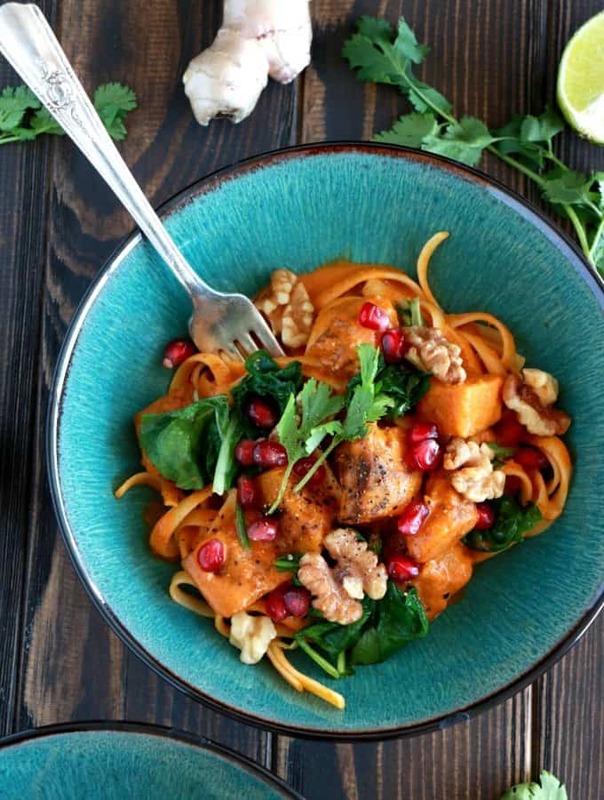 Really, you only have great reasons to discover kamut pasta and use them as your regular pasta. 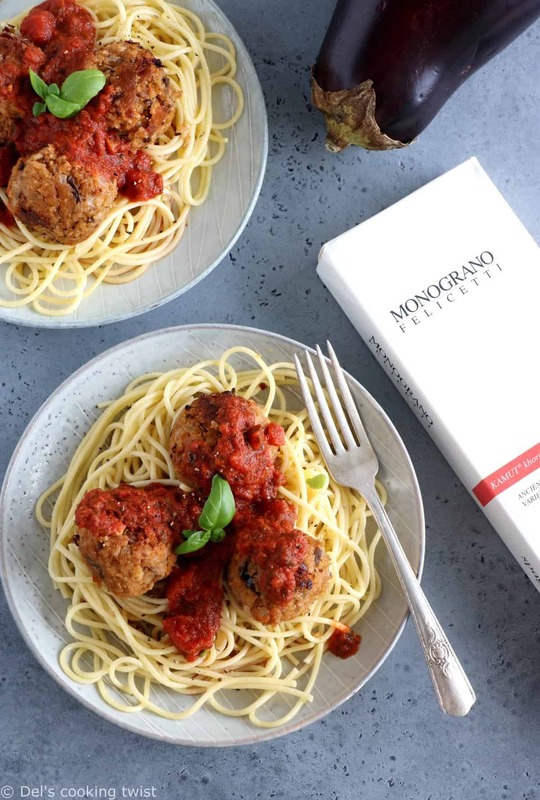 About that, I have good news for you: I’m launching a giveaway on my Instagram to make you win a Monograno Felicetti Kamut Pasta variety pack with an assortment of spaghetti, fusilli, and chiocciole (which are like giant maccaroni noodles). 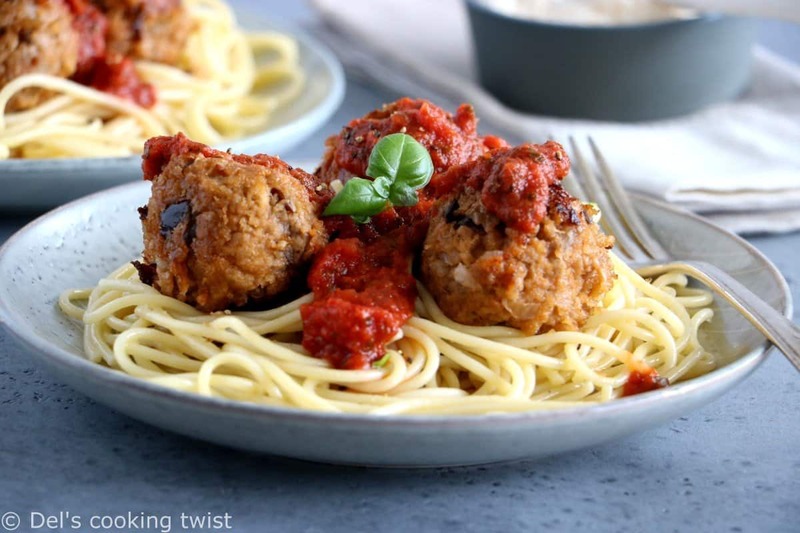 I am beyond excited to make you discover this precious grain full of healthy benefits and hope you will soon cook this wonderful vegetarian eggplant meatballs recipe, among others. Now make sure you enter the giveaway and stay tuned for the results! These vegetarian eggplant meatballs are game-changing and will make you forget about meat. Easy to prepare, they are best served with spaghetti, such as these ones made with kamut. In a large frying pan, melt minced onions and diced eggplants in olive oil, until soft. Season with salt and pepper. Add to a food processor and mix until a rather smooth texture. Transfer to a large mixing bowl and add tomato paste, bread crumbs and parmesan cheese. Incorporate the egg and stir well. Shape the mixture in 15 large balls (if too wet, add a little bit more bread crumbs) and transfer to a baking sheet covered with parchment paper. Place in the refrigerator and let set for about 30 minutes. 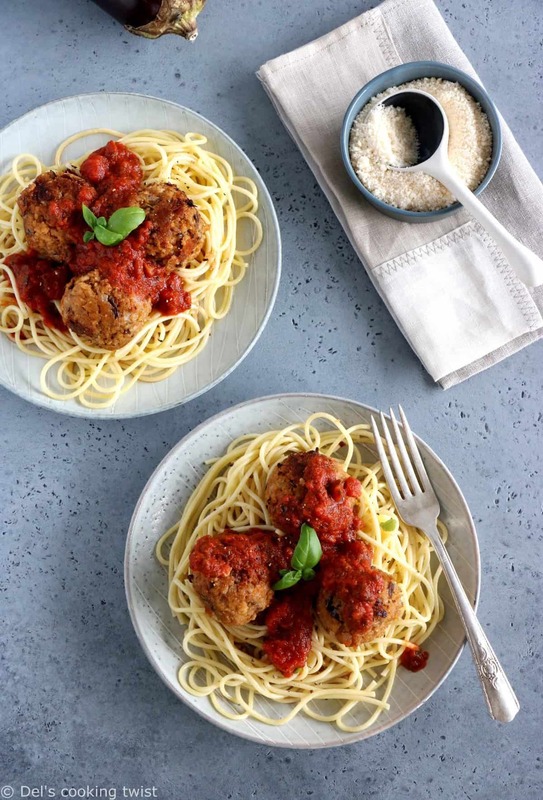 In a large frying pan, heat some oil and cook the vegetarian meatballs, a few at a time, making sure you move them often so they don’t stick to the pan. Cook on all sides, until slightly golden and crispy on the outside. 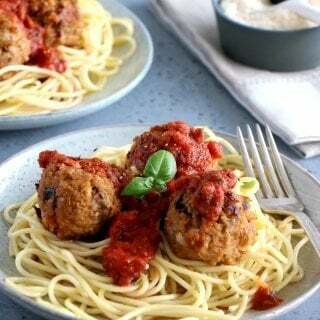 Serve eggplant meatballs with tomato sauce and fresh basil. Disclaimer: Please note that some of the links in this post are affiliate links from which I earn a commission. 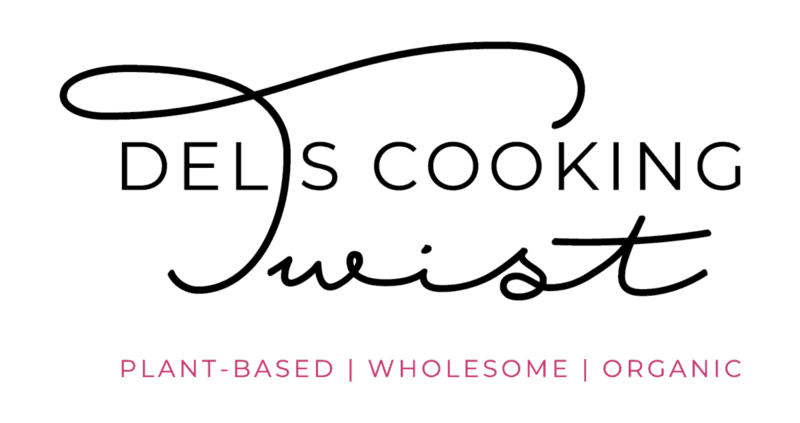 These are products that I know, trust, and love. Ces boulettes sont bien appétissantes !